I started my business in 1994 because I needed to do something. I could not find a job as a chef, so I started to paint while I was working in the back of the Antique Shop. I started with small signs and sold them for two or four dollars. Fast forward to today and we have stayed true to that: my wife, Maria and I now operate the business as a duet; she manages the inside of the shop with the antiques and I paint here in the courtyard. People always come back! They come once to your shop and then you see them come again later. 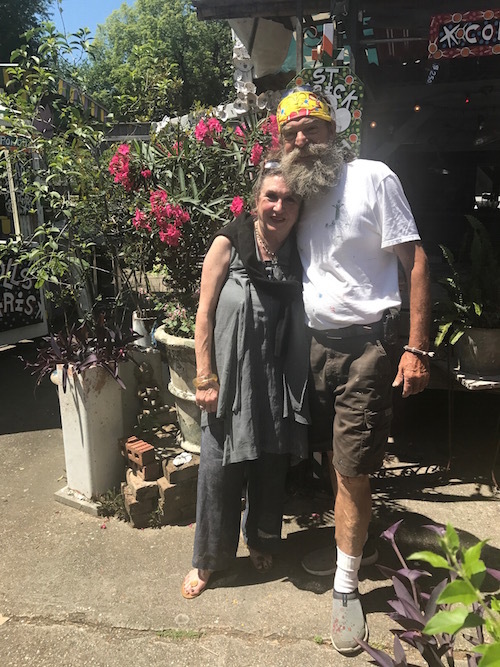 They don’t always come to buy a piece, but sometimes just stop to say “Hello!” They love to come during Mardi Gras, Jazz Festival, and for every other festival. At the end of every year, I know nearly everyone who comes in my shop. I have no email; I just wait until people come by. People who are local to New Orleans are my customers. Most of the people are families of New Orleans. Sazerac! It is a classic New Orleans drink. I do nothing that is not New Orleans. It is colorful and happy. Everyday I make people smile when they come here and see my signs. Having people around me like my wife and the people who help me paint brings me pleasure. Success in my business has a lot to do with surrounding myself with people I love, people who inspire me, and people who make running a business an enjoyable experience. What are your current or any upcoming goals for your business and/or community? I don’t alway know what’s going on. I like to go day by day. What I cannot do this week, for example, I just finish it tomorrow. The next big project is for Tucks for Mardi Gras next year. I like Joey K’s creole restaurant at 7th and Magazine. It is a small business that I love. The chef has been there a long time and is a nice old creole guy. I have put my signs there for nearly 10 or 15 years. When I go to meet them, I feel like I am a part of New Orleans. It’s nice when the entire place knows you. I also like to go to Ace Hardware, which is where I buy my painting supplies. Be like a bank. No passion. No ego. Do your job and that’s it. Don’t do what the next shop or person is doing. Stay focused and open the shop you want to have. Business is not an overnight success.